In 2017, Japanese stiltgrass (Microstegium vimineum) was discovered for the first time in Washtenaw County, MI. The dedicated efforts of volunteers from local and state stewardship agencies, along with private land owners, quickly had this infestation under control, and the stewardship community breathed a sigh of relief. We had stopped the invasion in its tracks. But in 2018, a much larger infestation of stiltgrass was discovered just a few miles away, covering over 12 acres across 60 private and public properties and counting. What do you do in the face of a seemingly overwhelming infestation of a new invasive species? Learn how the local stewardship community organized into the Washtenaw County Stiltgrass Working Group, and how they are addressing this urgent issue. Becky Gajewski​ ​is​ ​a​ ​Stewardship​ ​Specialist​ ​for​ ​the​ ​Natural​ ​Area​ ​Preservation​ ​(NAP)​ division​ of​ ​the​ ​City of​ ​Ann​ ​Arbor's​ ​Parks​ ​and​ ​Recreation​ ​Services Unit, where her mission is to protect and restore Ann Arbor’s natural areas and to foster an environmental ethic among its citizens.​ ​With several years of experience in ecological restoration, botany, and parks, she​ ​oversees​ ​NAP's​ ​biological inventory​ ​program​ and assists with management planning for park natural areas. As manager of the inventory program, she coordinates two field biologists and numerous volunteers who participate in several citizen science-based wildlife survey programs. 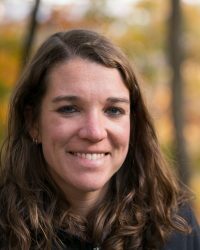 Becky ​is​ ​also in​ ​charge​ ​of​ ​data​ ​management​ ​and​ ​mapping for NAP and serves as a burn boss on prescribed burns.​ She​ ​graduated​ ​from the University of Michigan School of Natural Resources and Environment​ ​with​ ​an​ ​MS​ in Natural Resources and Environment,​ ​and​ ​also​ holds a​ ​certificate​ ​in​ ​GIS​ ​from​ ​Penn​ ​State​ ​University. 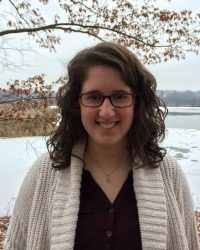 Katie Carlisle is the Stewardship Coordinator at Washtenaw County Parks and Recreation Commission. She is responsible for protecting and enhancing natural features in Washtenaw County Parks and Preserves in addition to promoting and coordinating volunteer opportunities. After receiving a Master’s of Science in Geophysics from Boise State University, she spent several years doing outdoor education, volunteer coordination, and stewardship work.